Including 3 day conference, lunches, coffee/tea, documentation and conference dinner on the 4th of September. Rates excluding VAT. Including 1 day conference, lunch, coffee/tea and documentation. No conference dinner. Rates excluding VAT. Date: Wednesday, September 4, 2013, 19:30 hrs. The Conference Dinner is included in the full registration fee. You are welcome to buy an additional ticket if you have registered for a Day Ticket, or want to bring an accompanying person. Places are limited, please book early to avoid disappointment. Free of charge but with mandatory registration. The workshop will end with a light dinner. Registration is open until September 1st. The total amount due (registration fees, full hotel pre-payment etc.) must be paid by credit card or bank transfer to Congrex Sweden AB. Your registration will only be accepted when full payment has been received. All payment should be made in Swedish Kronor (SEK). The following credit cards are accepted: EuroCard, MasterCard and VISA. We regret that no personal, company or Euro-cheques will be accepted. Please note that no invoices will be sent automatically. The confirmation letter you will receive by e-mail, after your registration has been processed, is to be used as a supporting document for the payment. If you cannot attend, your registration is transferable to another member of your organisation. Please inform Congrex Sweden AB in writing as soon as possible to whom your registration should be transferred to, in order to be able to print the correct name on the badge and also on the rooming list to the hotel. - In case of cancellation before August 1, 2013, all but SEK 2000 of your registration fee will be refunded. 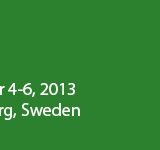 - In case of cancellation between August 1-15, 2013, all but SEK 3000 of your registration fee will be refunded. - After August 15, 2013, all registration fees are nonrefundable. Cancellations must be made in writing and sent to Congrex Sweden AB.